Today we are sharing our favorite character dining experience. Much to my husband's chagrin our family tends to do breakfast character meals. I like being in the parks before rope drop and wandering around while they are almost deserted, an added bonus - it's a great time to take photos. One of our favorites is Donald's Safari Breakfast at Tusker House in Animal Kingdom. Donald is featured, you get a photo with him while you are waiting to be seated, and you also meet Mickey, Minnie, Daisy and Goofy while having a wonderful breakfast buffet. And you get a glass of Jungle Juice, their signature drink, when you are seated. We stayed at the Yacht Club on our last trip and had breakfast at Cape May Cafe. There was a breakfast buffet there as well, although we didn't enjoy it quite as much as Tusker House. The food as service was great, it just felt more cramped. 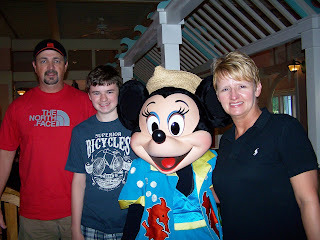 But we loved spending time with Minnie and Goofy while we were there. 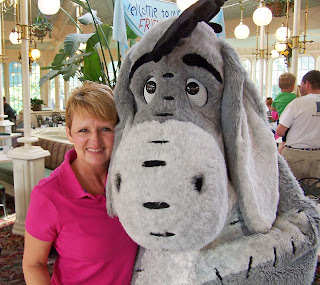 Our absolute favorite, must do character breakfast is Crystal Palace. Dakota was a HUGE Tigger fan when he was little, so our first visit was mainly so Dakota could meet him. We were so pleasantly surprised with the wonderful food, Mike is a big fan of having a personalized omelet made while he watches, and the characters there do such a fabulous job or working the room. They are very attentive and make sure you have all the pictures you want (within reason) before moving on to the next table. The service there is always impeccable, and you can get some great photos of Cinderella Castle while you're waiting on your table. I would love to know what your favorite character meal is, you can share it by commenting here or or on Facebook at the Magical Blogorail page or Disney Donna Kay page. Thank you for joining Magical Blogorail Red this month. We will be back on September 20th with an all new theme. Keep checking in with our blogs in between loops to keep up to date with our Disney news, photos and stories. If you are looking for more Disney magic, you can make your way over to The Magical Blogorail website to see all our members and their blogs, as well as all our previous loops. I have such weird memories of Crystal Palace. I haven't gotten over there since my early teens so maybe it's time for a revisit. We love Crystal Palace, it could be the mommy memories of Dakota meeting Tigger for the first time. You should go try it again. You should Melissa, that's the year Dakota was born - 16 years is too long between visits! Love Crystal Palace! My favorite is possible 1900 Park Faire, though. Of the ones you mentioned, Tusker House is a favorite of ours too!. Our absolute favorite is 'Ohana Best Friends Breakfast. Great food and so much fun! Lisa, I know all of my Disney friends are going to gasp, but I have never been to 'Ohana or tried Tonga Toast...guess that needs to go on the Disney Bucket List, doesn't it? We've done all three of these breakfasts (though we tend to prefer the suppers - especially on the dining plan, since they cost more!) But, of these 3, I probably liked the variety of food best at Cape May - but I agree with you that it seemed more cramped and rushed than at Tusker House. Tusker House is our current favorite breakfast and we have plans to go for our 3rd breakfast on our next trip. Haven't tried Cape May, but we love Tusker House and Crystal Palace! Makes me want a Mickey Waffle!! I would love a Mickey Waffle anytime Beth!! I am really missing my Happy Place!! Since there aren't many table service restaurants at Animal Kingdom, we love doing the character breakfast. Breakfast is easily my favorite meal of the day Kuleen. I would actually skip lunch all together but my boys have to have it. Such fun stories! And my husband would probably agree with yours about character breakfasts! Mike loves the food, hates getting up so early on vacation. I am letting him sleep in (some days) next trip. Some of my favorites here, and in particularly the Cape May Cafe for breakfast. Good memories from that visit, thank you. Bruce, we loved our stay at Yacht Club and it was so convenient to walk over to have breakfast. I am sure we will be back to Cape May again.